Product prices and availability are accurate as of 2019-04-02 15:27:50 EDT and are subject to change. Any price and availability information displayed on http://www.amazon.com/ at the time of purchase will apply to the purchase of this product. Calvin Klein started designing and selling coats in a New York City hotel in 1968, and from there a fashion empire was born. From designer jeans to designer underwear, Calvin Klein embraced the self confident and fashion-forward spirit of American design. 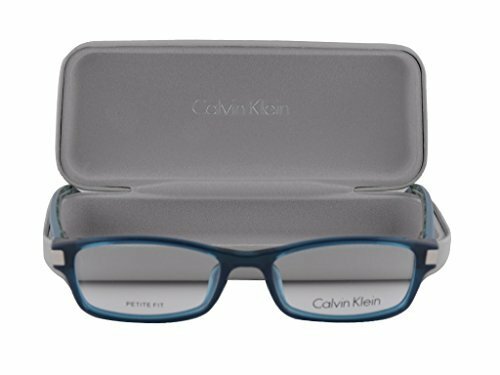 The Calvin Klein and CK optical collections have a rich blend of contemporary styles, classic silhouettes, and bold fusions of the two. The collections also feature exciting colors and finishes as well as top quality materials, like titanium and cellulose acetate. Like the clothing, fragrance, and underwear designs before them, Calvin Klein and CK eyeglasses reflect the heart of sophisticated American fashion.